The latest documentary directed by Mr. Zbigniew Gajzler shows a very special person – Mr. Krzysztof Jarzębski from Pabianice in Poland. He is a sportsman. But unusual. He had lost his legs because of a horrible illness – cancer. But he never gave up. After a series of surgeries he once again started from the beginning. He managed to exercise his body thanks to the strength of his brain. 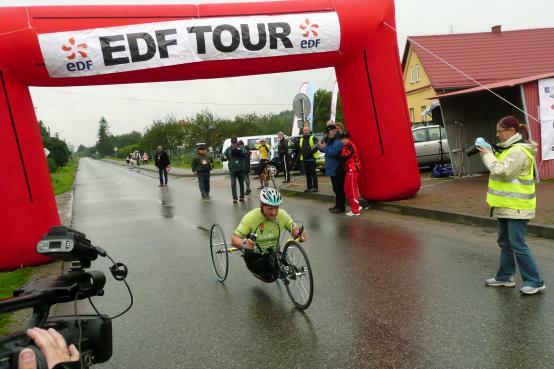 Even though he moves with a wheelchair he is so quick that he wins many marathons – now his hands are like his non-existintent legs. This is a story of a strengh of human being that demonstrates how one can guide his lives. The story of this exeptional sportsman is complemented by the music composed by Michał Lorenc. born in 1957. An artist and photographer, since 2000 he makes his own documentary films: "Julius Votheil - dreams of cinematography pioneer" (2002), "Sarid" (2005) - awarded in Melbourne, Berlin and Sofia, "Maestro" (2007), "Convicted to Siberia" (2009), “The marathonman” (2012). He used to work with cinamatographer Andrzej J. Jaroszewicz and Witold Szulc and the a composer Michał Lorenc.